With this post, I am launching a new series called “From the Archives” in which I will share my discovery of documents from various repositories. As I am working with transcribing notary contracts for the family of Charles Tourville and Sophie Arpajou, I found this by pure chance yesterday on the Website of the Archives nationales du Québec. It is impossible to save the image, so what I have here (a screen shot) is not very good. On my next visit to the Archives, I will ask for a copy. By clicking on the image though, you will be redirected to the document on the Archives’ Website and be able to enlarge the image. Plan of the “fief” Bourchemin-East, in the Seignory of Barrow (St-Hughes), divided in lots during the summer of 1822. What is exciting about this document is that we now have a better idea where exactly was the land of Charles Tourville, Antoine Hébert-Lecomte and Catherine Tourville (Charles’ sister) as well as others. We also know that François Tourville was a neighbor to his brother Charles for a while. I will try to find out what was the number of his lot. If you look at the lef-hand-side, you can read the name of Antoine Hébert-Lecompte, lot 43. Lot 44 is the property of Louis Girard but we know that Charles Tourville bought this land from Girard in 1827. Lots 38-39 are the property of the Plourdes’, the step-family of the sister of Sophie Arpajou. If you click on this link, you will see where the chemin Bourchemin East is today on Google Maps. Two weeks ago, Jen Baldwin gave us a homework on #genchat. She proposed that we revisit a document and see what we overlooked. Does it count if we overlook an entire document? I say yes! I was preparing for my #6 – 52 Ancestors Challenge, looking through my emails and I found a message from 3 years ago (I was sick 3 years ago for 3 months so that would explain why this document is still in my emails and not in my files). 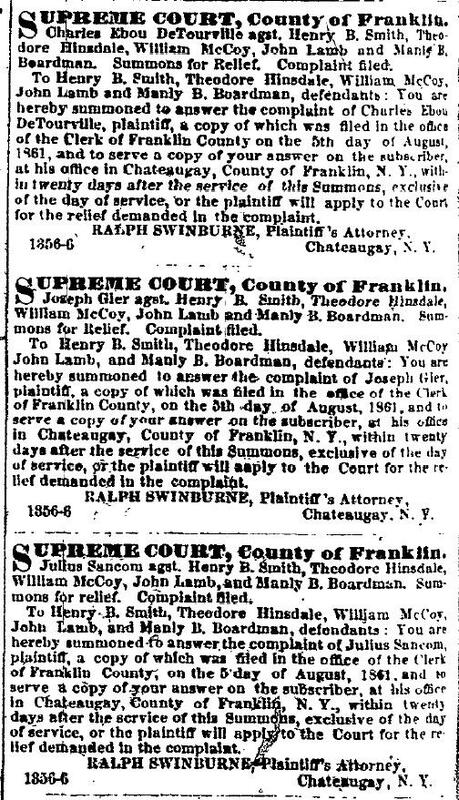 The document is an 1861 newspaperclip from a Franklin County, N.Y. newspaper (Malone Frontier Palladium) concerning a mortgage lawsuit. It involves Charles Tourville (born 1828 in Quebec) living in Chateaugay, N.Y. I will investigate this matter and it will become a future #52 Ancestors article. Some people asked me why the Tourvilles in Chateaugay were called DeTourville instead of Tourville, I always thought that this “De” was for “dit” (as in “dit” names). We have a proof here, “Charles Ebou (sic) DeTourville”. I think it is the first time I see the name Hubou in a US document.